Tea and Savories: Tri Training Day 6: Alien or insect? Tri Training Day 6: Alien or insect? 50 yards x 10 in 20 minutes. Not only is swimming the easiest, it takes the least amount of time. I wonder if I could use the rest intervals I am not using for swimming on the running days? Run one minute, rest two or three, maybe stop for a latte. For triathlons, people enter the water in waves. Each wave wears the same color swimming cap. 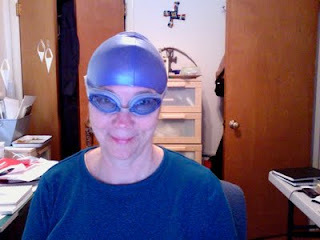 Today I donned my swimming cap to get used to it. It is made of a lovely, sleek silicon. I think I swam faster. the swimming cap requirement gradually faded. Am I claiming discrimination? Why, no, of course not. Obviously, skimmers have evolved to handle all types of hair.